Creating an SSO for Google can be a bit of a challenge. There are quite a few good examples for doing this in Java, but not as many for .NET. Here is my attempt to resolve that issue. This article will be broken up into two parts, the first of these is handling the authentication request from Google, the second of these will illustrate the response generation. Let's start by getting a good overview of the design. The entire process will begin when the end-user tries to access their Google Account. If the Google Apps service has been configured to use SSO, Google will generate an Authentication Request and send it on for you to handle in your SSO. It is then up to you to perform user authentication and generate a signed Authentication Response to send back to Google. Your first task will be determining the values of the two query parameters mentioned above and decoding them. In order to perform some of the decoding you will need to use a compression utility, I use a nice open source one available from ic#code at http://www.icsharpcode.net/OpenSource/SharpZipLib/. This code can be called from the Page_Load method to validate the request before prompting the user for their credentials. Be sure to check the Page.IsPostBack property to only call decodeAuthnRequestXML function on the initial page load. Once you have that, you can parse the XMLDocument and begin building your response. 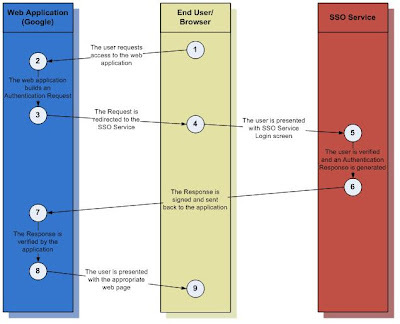 Look for Part 2 of the SSO series to demonstrate the building of the AuthnResponse.